Does a dramatic iPad-induced price cut make the Kindle DX the definitive e-reader? The original Kindle launched in 2007, with the Amazon Kindle 2 following in 2009, joined later by its bigger brother the DX. 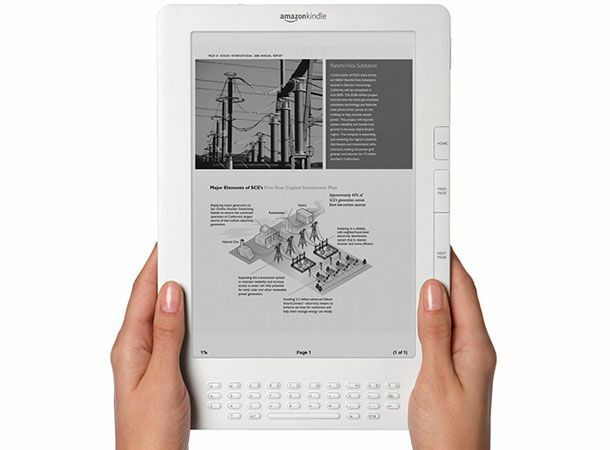 The big brother of the e-reader series boasts a larger 9.7-inch screen and added PDF support. Perhaps heightened by the success of the Apple iPad, Amazon has recently announced some considerablt price drops, dropping the DX by the princely sum of £100, to £320, in a bid to make it more enticing to bookworms. But with the Kindle App free to download on the iPhone, Touch and now Android handsets and the forementioned iPad, is the Kindle DX still worth a browse? One of the advantages the Kindle has above all other eBook readers is built-in 3G, via Whispernet, enabling books, magazines and newspapers to be downloaded to the device in 100 countries without a monthly subscription. The flexibility it offers is something no other e-readers can currently offer - the iPad WiFi+ 3G comes at a much higher price (from £530) and with monthly subscription charges. The 9.7-inch screen is similar in size to a real book, but measuring 244mm long, the device itself is far bigger than a paperback and a good 40mm longer than the original Kindle. It might not sound like much, but makes it far less flexibly to carry around - while it'll fit comfortably in a laptop bag or (large) shoulder bag, it's not handbag friendly at all. Despite being a comparatively light 290g, the Kindle DX is awkward to hold with one hand for prolonged periods of time. Portability is better in other areas, with battery lasting a week with wireless on and two weeks with it turned off. Amazon has retained the QWERTY keyboard, but conversely the buttons feel more cramped. 'Previous' and 'Next Page' controls have been removed from the left hand side, which makes it impossible to turn the page when you're holding the device with your left hand. Support for automatic page rotation means you can get around this by turning the Kindle upside down, but that's no substitute for a dedicated button. The e-ink screen is fantastic for reading, text is sharp and they're three's little problem with reflections. A shortcut key lets you choose between eight text sizes. Internal storage on the DX has been boosted to 4GB, equating to 3500 paperback books. With 620,000 contemporary titles and 1.8 million out of print books (pre 1923) to choose from, the Kindle Store is far more exhaustive than the iBooks store and it's highly unlikely you'll ever run out of things to read. Prices are reasonable, Stieg Larsson's Girl With the Dragon Tattoo costs $5 (£3.30) and Dan Brown's The Lost Symbol $13 (£9.50). Like on Amazon.co.uk, each book has reader reviews and ratings. You can also download a chapter of each book for free. Newspaper selections come from 19 countries. in the UK this includes The Times The Independent, The Daily Mail and Daily Telegraph. All are priced between $0.99 and $1.49 an issue, with month subscriptions ranging from $9.99 (£6) for the Evening Standard to $27.99 (£18) for The Financial Times $22.99 (£18), with a 14-day free trial. While downloads are very impressive at less than a minute, when it comes to browsing the Kindle Store, it's a far more laborious process. See a book you like? It takes around 10 seconds for the synopsis to load. Swap between pages and again you're waiting, this time for the thumbnails to load. On numerous occasions we had to check the Kindle Icon in the corner was moving to be sure the device was actually doing anything. We also had a few issues losing our 3G signal, resulting in us restarting the Kindle DX several times, this was in central London though and didn't happen outside the city. Hidden under the 'Experimental' menu is the web browser. It's fine for text websites, such as BBC News and Wikipedia and a quick check when you're out and about. But the small, black and white screen isn't very good for photo-heavy websites and it's pretty slow. Text to speech reads out your tomes, with a male and female voice to choose between, with adjustable text speeds. Connect via USB to transfer and play back mp3s and PDFs. PDF support is useful, but is it really something the majority of users will take advantage of? Especially when the iPad, with its colour screen, does PDF support so much better. With its simple interface, enhanced screen, integrated 3G for on-the-go downloads and huge selection of books, for anyone serious about reading, the Kindle is the best ebook around. The web features are acceptable, but a sideshow, so if you value internet capabilities foremost, go for the Apple iPad WiFi + 3G and download the Kindle App instead. However, the Kindle DX's biggest rival is its sibling - in fact it's really hard to see why anyone would buy the Kindle DX above the original Kindle. Sure, the screen is bigger (9.7 to 6 inches) and it can hold more books (3500 to 1500) but it's far less portable for day-to-day commuting. However it's the price that's the biggest issue, with two devices so similar, it's really hard to justify paying £320 over £170. An extra £150 buys a lot of books.